To women all over the country, from all walks of life, this uncomfortable uncertainty is all too familiar. Now—for inspiration, for affirmation, for a divine connection—you have a new place to turn … to this authentic look at what it takes to pursue God with abandon, by acclaimed author Stacy Hawkins Adams. 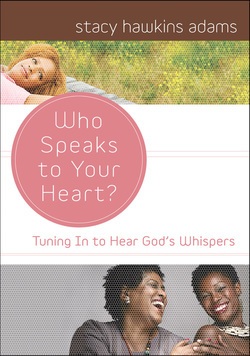 Offering insight, inspiration, and practical ideas on how to connect more often and more deeply with God, Adams helps give you and women the world over the courage to go deeper and grow deeper in God’s word to hear Him more clearly. Women young and older will be empowered and renewed by Adams’ reminder that—regardless of the labels placed on you by society, your family, your friends, and even yourself—your best and most important title is the one given by God … chosen vessel.